An SABC Newsroom studio guest started smoking dagga while being interviewed on live TV. 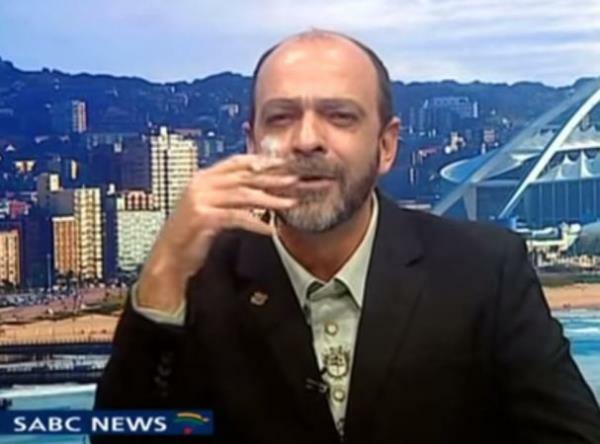 Andre du Plessis from the Cannabis Working Group admitted the cigarette he lit up when he appeared on SABC's 24-hour TV news channel, SABC News (DStv 404), was dagga. The smoking of "marijuana" or "weed" is illegal in South Africa. He had been invited onto the show for a debate with David Bayever, deputy chairperson of the Central Drug Authority (CDA), about the legalisation of the drug. The discussion became quite heated, until Du Plessis seemed to decide actions spoke louder than words. He lit a doobie while Bayever was talking. Gasps and nervous titters could be heard from behind the scenes. When asked for a closing argument, cameras focused back on Du Plessis. He simply exhaled a cloud of smoke and said, "I think that's all I gotta say." Without waiting for the flustered presenter to bid him farewell, he got up, yanked off his mic and ear piece (with some difficulty) and stalked off.